I think when I first came across one of the web sites with systems that used water to cool their processors, I was hooked. I knew that I'd end up doing this eventually. 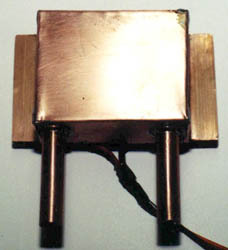 When I was working on the last heat sink, the Aluminum & Copper model, I had hopes of running dual TECs. I found that even this sink, which performed as well or better than any other sink I had tried, was not going to be able to handle dual TECs. Even if it could, the amount of heat that would be dumped into the case would be ridiculous. 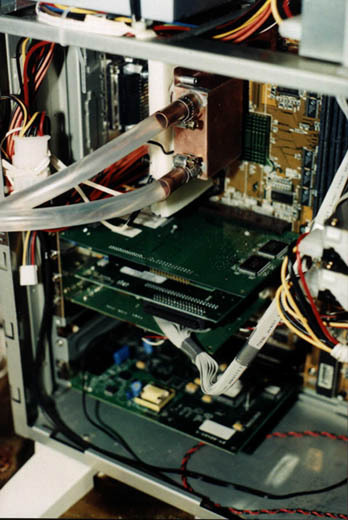 It was time for liquid cooling. 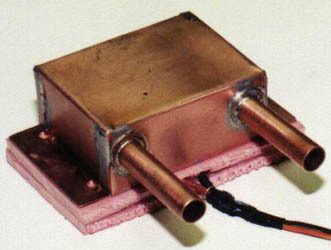 The primary plus in using water rather than air to transfer heat from the processor is water's greater thermal conductivity. Thermal conductivity is the measurement of the speed at which heat travels through a material through conduction. In the US, it is commonly expressed in terms of the number of BTUs of heat which will travel through one sq. foot of material which is one inch thick when there is one degree F temperature difference across the material (ie. 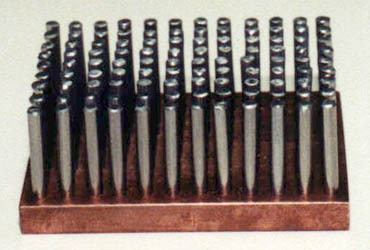 Delta T). This expression is often stated as btu/in/hr/sq.ft/°F. In SI units, (SI = Système Internationale d'unités) this is expressed as W/m K, (watt per meter degree kelvin) which is the energy per second conducted through the material per square meter, when a temperature gradient of 1K/m is applied to the material. So what's the difference in thermal conductivity between air and water? About 30 times as great for water than for air. (.02 W/m K for air and .6 for water.) The following chart lists some common elements and compounds and their thermal conductivity. change with the purity of the material. A radiator and fan to dissipate the heat into the air. And a pump to circulate the coolant. I also wanted an easy way to change the coolant and remove trapped air from the system. Since I had just finished testing the aluminum and copper sink, I was still happy with the way the two metals working together were able to remove heat from the processor. I decided to build a scaled-down version of that sink to use as the "heart" of the cooling system. The first sink would be a single TEC. This choice was an easy one as I only had enough copper left for a single TEC sized sink. I had learned a little about boring multiple holes in copper from the last project. This is not quite as easy as it would appear to get the holes to a line up - even with the use of a cross slide vise - also known as an X Y table and vise. 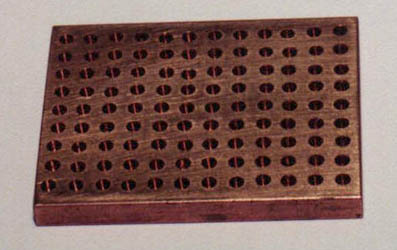 The small bits I used for the pilot holes tend to "walk" a little - even when the copper is center-punched first. The holes are fairly straight, but still not perfect. The size of the base is 2" X 2.5" X 1/4". As with the last two-metal sink, the trick for getting the pins in nice and tight is to bore the holes a bit undersized, then heat the copper and freeze the aluminum. This gives you a couple of minutes to insert as many pins as possible, then repeat the process. I was glad that I only had 108 pins to insert this time. before being inserted into the base. With the pins inserted, it was time to turn my attention to constructing the water jacket. I wanted to be able to solder the jacket to the base, so that meant using copper sheet for the jacket. I made a couple "mock-ups" in cardboard before I settled on a shape that I thought would work. I laid it out in AutoCad, and cut a template. The pattern is ready to cut. Once the pattern was cut, I drilled a couple 3/8" holes, put a flange on the copper tubing, added some copper washers and soldered in the tubes. I used a propane torch along with solid core plumbers solder and flux. Soldering the tubes was easy as the thickness of the tubes and sheet copper were about the same. 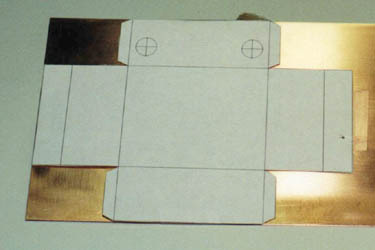 I then bent to copper sheet to give me the box shape. It's beginning to take shape. The next step was probably the most difficult of the project. I needed to solder 0.032" copper sheet to the 1/4" copper base. I have done enough soldering and welding to know that trying to get the two pieces of metal to about the same temperature is the trick to getting a good joint. This heat sink was going to be holding water with lots of electronics around it that would not take to kindly to getting wet. I practiced a couple times on some scrap pieces I had, before attempting to solder the joint. 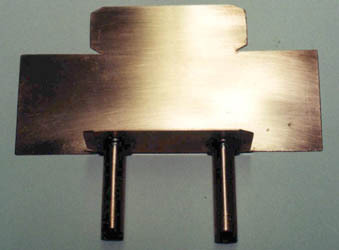 The 1/4" stock needed to be heated without passing the torch on to the sheet copper. Since copper is such a good conductor, the heat spread out to the sheet copper with no problem. I liberally coated both sides with flux and soldered away. Piece of cake - or to rephrase that, I got lucky. I finished by soldering down the tabs on each end. With the water box attached to the heat sink, I added one 40mm TEC, some insulation, and the same cold plate I had used in the air cooled version of the sink. During the initial tests on the work bench, it was evident that I would need much more insulation than the two small pieces I started with. I cut some styrofoam to the same size as the Celeron and put that in place of the two small pieces. This seemed to do the trick and focused the removal of heat to the Celeron's slug rather than the air around the heat sink. Because this was only a single peltier directly in line with the cold plate and the processor's slug, it was very easy to insulate. to a much larger piece during tests on the bench. Condensation was not a problem with this sink.